Physical Graffiti is regarded by many as Led Zeppelin's last great album. And putting aside recent 'new material' rumours, the 1975 release marked the halfway point of Zep's long and loud music-making career. Physical Graffiti is frontman Robert Plant's favourite Led Zeppelin album, and one which he says represents the band at its most creative. Perhaps by 'creative', Plant actually meant 'epic': the original eight tracks were far too long for a single LP so - by including some previously unreleased recordings - it became a double. One unheard song to make the cut, Houses Of The Holy, was also the inspiration for Led Zep's previous album of the same name. 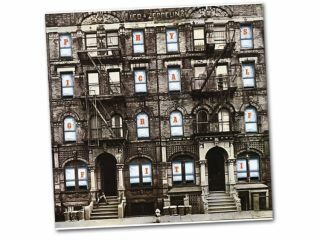 Physical Graffiti's recording process took 15 months. For the era, that's fairly standard for a touring band, but it could have been wrapped-up in half the time had John Paul Jones not been 'taken ill'. In truth, the bassist was disillusioned and seriously considered becoming choirmaster at Winchester Cathedral before Zep's manager Peter Grant talked him out of it. Upon return, Jones obviously felt rejuvenated because he even laid down some additional guitar - the only Led Zep album to boast such a fact. "When we were up at Headley Grange recording Physical Graffiti, Ian Stewart [the Rolling Stones' unofficial keyboard player] came by and we started to jam. The jam turned into Boogie With Stu, which was obviously a variation on Ooh My Head by the late Ritchie Valens, which itself was actually a variation of Little Richard's Ooh My Soul." Physical Graffiti's artwork was designed by Peter Corriston, and features a photograph of 96 and 98 St Mark's Place in Manhattan. The same designer was responsible for the Grammy Award-winning cover art of The Rolling Stones' Tattoo You. This album contains Waiting On A Friend, the video for which is shot on the doorsteps of none other than 96 and 98 St Mark's Place. I'm just standing in a doorway"